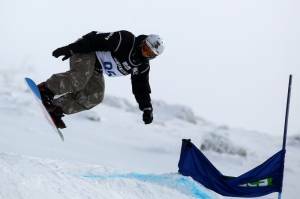 Lake Wanaka, New Zealand – With the sport on the brink of being included in the Paralympics, 100% Pure New Zealand Winter Games on Wednesday held its first WSF Para-Snowboard World Cup at Cardrona Alpine Resort, featuring a strong international field from both sides of the world. It was an all-American victory with world number one, Amy Purdy, of San Diego, Calif., taking out the women’s in a combined best of 202.69 and Evan Strong, also world number one, taking out the men’s in 148.25. The men’s race was incredibly close between X Games gold medalist, Evan Strong, and New Zealand’s Carl Murphy, world number two, who took silver. As well as the competitive World Cup competition, today’s race also included the demonstration sport of sit ski on the gravity cross course. Corie Peters of New Zealand clocked the fastest time in 190.97 after just three weeks in a sit ski. In the women’s Gemma Fletcher taook first in 222.40. The snowboard cross competition continues Friday with the FIS Continental Cup snowboard cross at Cardrona Alpine Resort.